Live up to the minute updates, information and analysis for the travel trade to enable profits via quick and effective decision making. We are the only travel media site in India to offer special sections on tourism market policy changes, numbers &, industry appointments and events and news on niche travel segments like medical, adventure and luxury tourism among others to help travel trade professionals keep a finger on the pulse of the fast evolving Indian traveller and the travel industry in India. 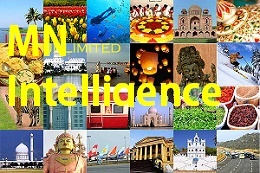 India’s only travel media site focussed on live news for travel consumers to and from India- i.e you and us. We cover the sector for the latest information that you can really use – the changes in visa policy, travel deals by the likes of airlines, tourism promotion boards and the rest, events like music, adventure fests, theatre and literary festivals that are a must do, new technology and and products that make your travel planning, booking and experience better besides a host of travel ideas in form of easy to read and use city guides, things to do and curated travel experiences. is a premium research and information service brought to you by Musafir Namah. This is your one stop shop for keeping abreast trends shaping the travel landscape for India. The service includes latest cutting edge reports, insights as well as a data library to enable timely decisions making for the corporate growth strategy. Executives from travel segments including hospitality, transport, technology, retail and lifestyle will find this service invaluable.